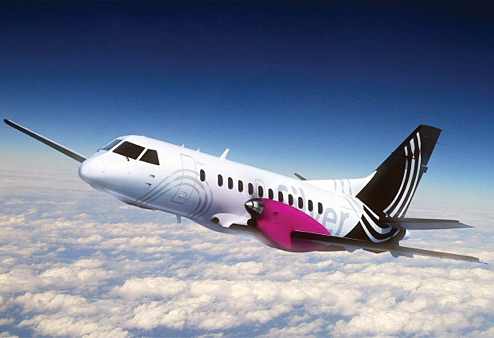 Silver Airways has emerged from the remnants of Gulfstream International with its first Saab 340B. Fort Lauderdale, Fla.-based Gulfstream International Airlines continues its transformation with a name change–to Silver Airways Corp. The airline emerged from Chapter 11 bankruptcy protection in May, when its new owner, Chicago-based asset management firm Victory Park Capital, provided $5 million in debtor-in-possession funding. Launched in 1988 to serve as an on-demand charter carrier serving South Florida, Cuba, and the Bahamas using Cessna 402s, Gulfstream International graduated to Beech 1900Cs in 1994, the same year it signed a code-share agreement with United Airlines. Two years later, it began scheduled service between Fort Lauderdale and the Bahamas. Gulfstream International signed on as a Continental Connection carrier in 1997. In 2007, the company went public, and a year later, it added its Cleveland hub. Following its Chapter 11 filing in 2010, only Mickey Bowman, vice president of the company’s Essential Air Service (EAS) program; Phil Le Fevre, vice president of flight operations and director of operations; and Craig Attell, vice president of safety, security and regulatory compliance, remained with the management team. Others recruited by Richardson include David Querio, COO; Curtis Berchtold, vice president and CFO; Peter Barry, vice president of technical operations; Matthew Holliday, vice president of sales and marketing; and Donna Tipsword, vice president of human resources. The airline continues to code share as United Express out of Florida and United’s Cleveland hub, where it offers EAS to six cities. It also flies independently out of Billings, Mont., to seven EAS markets and “remains open” to new opportunities for further EAS flying, said Richardson.